Our coaching staff believes the most important pay-offs from participation in this sport last far longer than the trophies or banners we receive on competition day. It is important to our coaches to teach life skills such a good sportsmanship, teamwork, dedication and setting goals. If our only goal is to win a competition, we are guaranteed disappointment at some point. Sure, it is fun to win, but setting individual and team goals ensure the athlete continues to progress and feels a sense of accomplishment even when we don’t take home a trophy or banner. ​We believe the best way to get respect from our athletes is to respect the athlete. We do not use a coaching style of intimidation or fear. We value each athlete and meet them where they are in their skills to help develop them to the next level. That doesn’t mean we are not strict or have rules, we do. But we find that youth athletes are more likely to follow your rules if they respect both the rules and the coaches. Nailing all of our stunts and tumbling in our routine. We can’t control what the judges may or may not like on any given competition day. ​We can only strive to do our best, to be our best all the time. 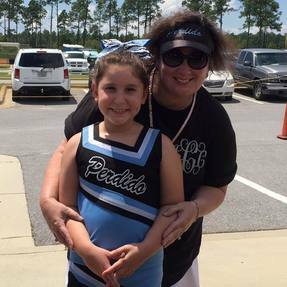 Born and raised in Gulfport, Mississippi, my passion for cheerleading began in Junior High. After graduation from high school, I continued my love for cheer by coaching school squads. Recently, I have coached at the Rec. level for 12 years, and served the local youth cheerleading league as the Commissioner for the last 4 years. My decision to open a gym is based both on my love of the sport and my love for coaching youth. I am USASF and AACCA certified and hope to use my experience and training to help raise athletes who will fall in love with the sport of cheerleading. As a child I had dreams of being in the circus with skills such as juggling, uni-cycling, stilt walking, acrobatics, dance, and gymnastics. By high school I had changed my focus to cheerleading and participated in both spirit cheer and competitive high school cheerleading. My love for cheerleading quickly led to me coaching my first All-Star team at the age of 17. I spent 10 years in Crestview as a coach and All-Star Director . In my 5 years as All-Star Director, I grew a program from 12 athletes to multiple teams including All-Star, prep, exhibition, and special needs. I also worked with 11 different school cheer teams from the area including state cheerleading champions Davidson Middle School and Crestview High School. After moving to Pensacola, I coached at Cheer Omega teaching recreational tumbling, stunt classes, as well as All-Star tumbling for 2 years. I became a proud member of the Gulf Coast Elite Cheer family in September 2016. I am blessed to be a part of this wonderful program where I can share my knowledge with my athletes and staff while continually growing and learning as an educator. I'm Coach Trudy. I went to Southern University studying Criminal Justice and I am the mother of four girls. I started coaching at Brent Youth Sports Association (BYSA) in Pensacola 10 years ago. I became the Cheer Coordinator 8 years ago. I started at the mighty mite level and moved up with my daughters through the Rec cheer levels. I have been coaching at GCE since December 2015. ​I love coaching not only because of the joy and energy that the athletes have but the spirit of joy that they give me. I'm Coach Candy! I am from Calgary, Alberta, Canada. I grew up playing competitive sports such as hockey, softball, and volleyball. I started cheering in college and immediately knew it was my passion. In 2005, I graduated from Southern Alberta Institute of Technology with an Associates in Marketing and I transitioned into All-Star cheer. I also started competing in an all-girl quad/stunt group and was on the Performance Stunt Team for the Calgary Roughnecks professional lacrosse team. In 2009, I competed at Worlds in open coed 6, where we placed 7th and won Nations Cup for Canada. In 2014, I graduated from Western Washington University with a Bachelor of Science in Kinesiology. I have been coaching All-Star cheer since 2005. I am also Positive Coaching Alliance (PCA) Double-Goal Coach Certified and American Red Cross First Aid and CPR certified. I have been USASF credentialed since 2008. I am excited to continue my coaching career at GCE! I'm Coach Jennifer! My love for cheer began in middle school. I began cheering at the Rec level and went on to cheer in high school. I started my coaching career at the Rec level and for 12 years coached every age from Mighty Mite to Juniors. In 2014, my daughters and I made the switch to All Star Cheer with GCE and have never looked back. I am USASF certified to Level 3.